n her thoughtful and innovative new book, Marcia B. Baxter Magolda writes of "bridging the worlds between educator and students." There is perhaps no task more fundamental to effective teaching and learning. All too often a distinct gap develops or cannot be overcome between instructor and student, one that leaves each struggling to understand the other's position. The professional quest for principles of structure and process that can help close this divide is both evolving and unending. 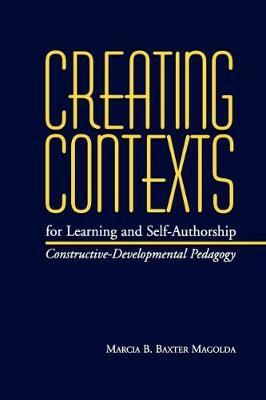 This book is intended to help college faculty create conditions in which students learn to construct knowledge in their disciplines and achieve self-authorship. A significant, and often overlooked, dimension mediating learning and self-authorship centers on learners' ways of knowing, or their assumptions about the nature, limits, and certainty of knowledge. A learner who assumes that all knowledge is certain expects to hear answers from an authority figure; in contrast, a learner who views knowledge as relative expects to explore multiple viewpoints. By taking a constructive-developmental approach, Baxter Magolda demonstrates how students' ability to construct knowledge is intertwined with the development of their assumptions about knowledge itself and their role in creating it. She shows how the structure of constructive-developmental teaching hinges on three principles: validating students' ability to know, situating learning in students' experience, and defining learning as teachers and students mutually constructing meaning. Unlike most of the literature on the subject, this book takes abstract pedagogical principles and translates them into practical methods. By observing four semester-length college courses in mathematics, zoology, human development, and education and intensively interviewing students and their instructors, Baxter Magolda provides much-needed, concrete principles that will lead to valuable improvements in the classroom environment. With an enhanced level of understanding of the teaching-learning relationship, professors will be able to teach better, and students will be able to learn better, thus preparing them to meet the demands inherent in adulthood and preparing them to take an active role in creating a better society. Those actively involved in higher education, whether college faculty or students in graduate programs, as well as anyone focused on education in general will find much of interest in this book.